College hockey is better when Wisconsin is good. Several years ago, when the Kohl Center was rocking and the student section was packed, there was no better place to watch a hockey game. However, after last year's disaster of a season, pressure is mounting on head coach Mike Eaves. In the "what have you done for me lately" environment that is DI sports, there is little room for error for a tradition-rich program. In 13 seasons behind the Wisconsin bench, Eaves has compiled a 259-206-58 record. 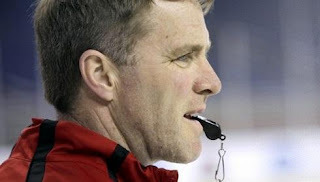 During his tenure, the Badgers have won one national championship (2006), played in two Frozen Fours (2006 and 2010) and made the NCAA Tournament seven times. This is a critical season for the 3-4-3 Badgers. After a brutal 4-26-5 2014-15 campaign, the Badger faithful are restless. There is a Fire Mike Eaves Twitter account (@firemikeeaves). There is an iPetition to Fire Mike Eaves. USCHO.com has a Fire Mike Eaves fan thread and countless other sites devoted to a Badger coaching change. In response to the calls for his ouster, Eaves fired long-time assistant coaches Gary Shuchuk and Matt Walsh. When he was asked if Eaves' job is at risk, Wisconsin AD Barry Alvarez first gave a 'no comment response'. After further pressure, Alvarez said, "I can't lose confidence in a coach that has had as much success as he's had,'' Alvarez told the Madison State Journal. One of the primary problems cited in the Bucky's Fifth Quarter is poor communication with hockey recruits: "There are countless horror stories of Wisconsin's recruiting blunders. From not returning calls from prominent player advisers to jumping into recruiting races on players laughably late in the process, low-balling in-state recruits on scholarship offers, pressure tactics in an effort to get a commitment before other schools can get a kid on campus and a host of other issues." Wisconsin almost never sends an assistant on a recruiting trip if he is going to miss Badger games. Wisconsin didn't send a coach to court top prospect Brock Boeser while he was in Madison to take on the Capitols in an USHL game five miles from the UW campus. Boeser ended up committing to North Dakota. Many around the college hockey world hope Eaves turns the program around. Wisconsin has a marquee program that is important to Wisconsin and the sport. While the Kohl Center is not going to be as crazy as it was several years ago, there will still be 8000+ fans in red and white and a student section that never sits rocking the house. The Pios are not guaranteed a sweep this weekend against a team under fire and a coach with his back to the wall. Pios need to play hard every shift this weekend and take care of business. Score early and often.